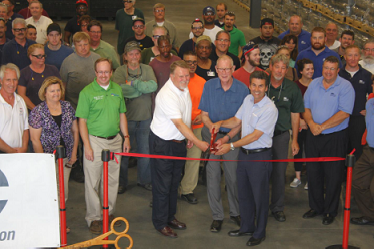 City and Madison Kipp Corporation (MKC) officials joined Sun Prairie Chamber of Commerce ambassadors and MKC employees on July 14 to cut the ribbon officially opening a 90,000 sq. ft. addition to MKC’s Sun Prairie facility in the Sun Prairie Business Park. The $3.5 million expansion will allow MKC to house all of its Sun Prairie warehousing and manufacturing operations at one location. “We’re already operating here and we thought it was an appropriate time to take a pause to recognize this event, say some thank you’s to some folks who have been supportive, so we wanted to do that,” MKC president Tony Koblinski told the group assembled Thursday for the ribbon cutting event. Noting the construction for the expansion began eight months ago, Koblinski also gave credit to developer John Schaefer and CSI Construction for completing the addition in less than eight months. Koblinski also thanked the Sun Prairie Chamber of Commerce, from whom MKC purchased 100 chamber key tags to distribute to those attending the event, for their support of the project. “I just want to recognize the work the chambers do on a daily basis to make Dane County and the surrounding area a great place to invest and continue to grow,” Koblinski said. Koblinski also thanked the employees for their support during the construction. MKC is a major producer of precision-machined components and system sub-assemblies for customers in the transportation, industrial, lawn & garden, and leisure-end markets. Mayor Paul Esser added his thanks to MKC and its employees and said the expansion is good news for Sun Prairie. “We as the city of Sun Prairie are so pleased you have chosen to expand in Sun Prairie. Kipp is a good corporate citizen in our community – we like having you here,” Esser told the ribbon cutting crowd. “I like hearing all of the things Tony is talking about coming – in 2018, ’19 and ’20. That’s good for all of us – it’s good for you and it’s good for us as a community. The mayor recalled being in attendance at the November groundbreaking. Esser thanked the company and pledged the city’s support to aid MKC’s growth into the future. Noting the expansion positions MKC for additional products for both domestic and foreign customers, City of Sun Prairie Economic Development Director Neil Stechschulte said both Schaefer and MKC deserved credit for the project. Madison-Kipp employees generously donated food for our adopted high school, East High in Madison, WI. Pinney Capital Campaign Donor Spotlight: Madison Kipp Corp.